The rainfall of the last few weeks has raised the water level of Halliste river in Soomaa by a metre. Pre-winter is not a habitual „fifth season“. Air temperature for a night and day period is three and half degrees on average and water temperature is more than five degrees above zero. The Soomaa people have certainly their water transport vehicles ready but what will Father Christmas do there in a week with his reindeer and sleigh? EMHI: Halliste River, Riisa hydrometric station. Highest (red), average (green), and lowest (blue) long-term, 1930-2005, recorded water levels for the month and presently recorded level (violet). The EMHI Riisa station is some kilometres downstream along the Halliste river from the Raudna river mouth but reflects the water level in Soomaa quite well. 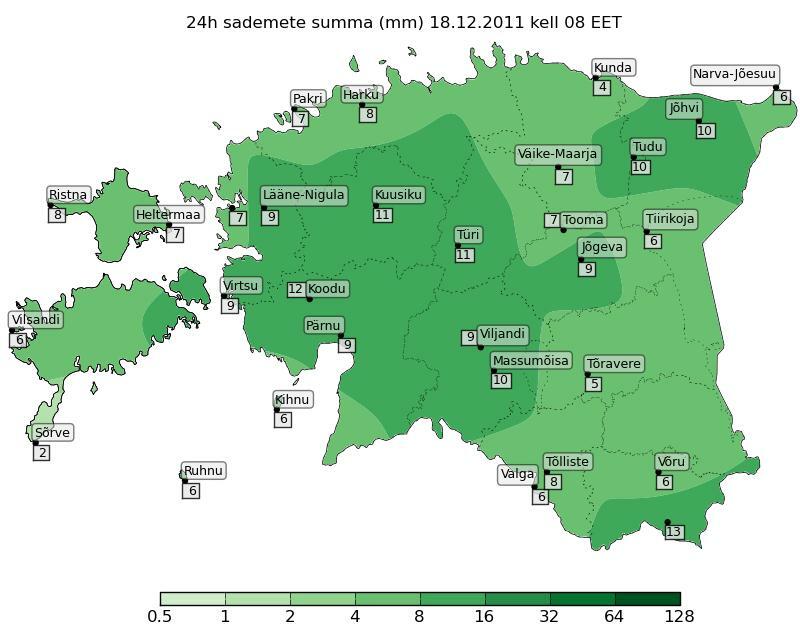 Precipitation has been quite even in the whole of the Pärnu river watershed.